Free Shipping Included! 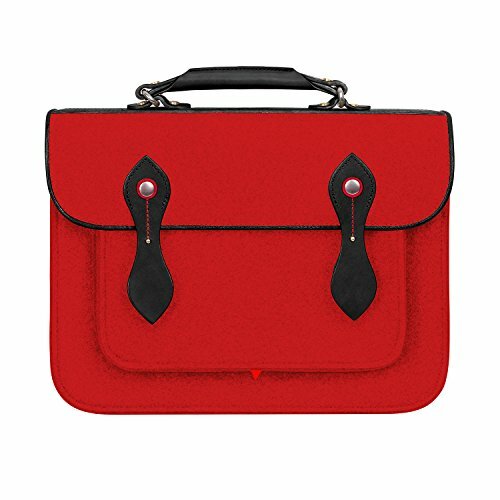 TOPHOME Retro Wool Felt Laptop Backpack Messenger Bag Laptop Case Business Office Handbag with Genuine Leather Handle Briefcase for 13.3 inch Macbook Notebook/Tablet/Acer/HP/Dell/Lenovo etc,Red by TOPHOME at FloType. MPN: THUS-CCam13-RD. Hurry! Limited time offer. Offer valid only while supplies last. Wool felt is made of 100% Natural Wool and Genuine Leather .Environmentally friendly material. Perfect protected from dust, scratches and light impact damage. Water-resistant, fire-safe, and prized for its deeply saturated lightfast colors. Perfectly designed for Apple Macbook / Macbook Pro with display size 13 or 13.3 inch / laptops / notebooks/ ultrabooks; It may not snugly fit all 15 laptops, please check the dimension before purchase. If you have any questions about this product by TOPHOME, contact us by completing and submitting the form below. If you are looking for a specif part number, please include it with your message.